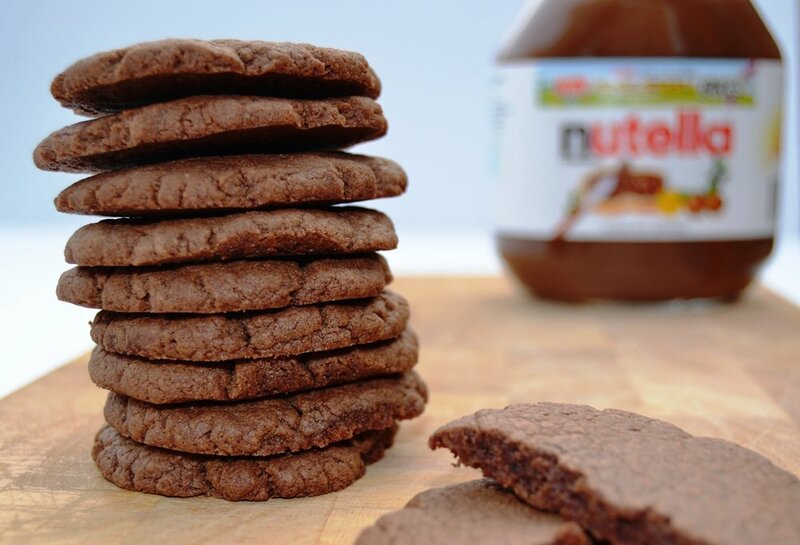 Only three ingredients are needed for these Nutella Cookies making them slightly dangerous as they are very easy to eat. They are moist, chewy, chocolatey and hazelnut-y. A batch of these delicious Nutella cookies will not last long. If you like crunchy cookies, add 40g of chopped hazelnuts to the cookie dough. You can also add a drop of vanilla essence if you like but it doesn't really need it. Preheat the oven to 180 fan / 200 C / gas mark 6. Line one large or two medium sized baking sheets with baking paper. Mix the egg and Nutella = together in a bowl with a fork until smooth. Add the flour and mix again. When the mixture becomes quite crumbly, use your hand to press the crumbs together to make a ball of cookie dough. Knead the cookie dough until it becomes an even consistency with no white specks of flour. Roll teaspoons of cookie dough into walnut sized balls. (The recipe makes roughly 20 cookies, but don't worry if you end up with a few more or a few less.) Evenly space out the cookie dough balls on the baking sheets. Press the balls of cookie dough down with three fingers to make a round cookie shape.